Were you affected by the earthquake in Myanmar? Share images, video and information with CNN's iReport . Don't do anything that could put you at risk. (CNN) -- A powerful earthquake hit Myanmar Thursday near its borders with China, Thailand and Laos, the U.S. Geological Survey said. The quake hit in eastern Myanmar, about 55 miles (89 km) north of Chiang Rai, Thailand, the survey reported. One person was killed by a roof collapsing in Chiang Rai, Thailand's MCOT network reported, and tremors were felt in the capital Bangkok, 479 miles (772 km) south of the epicenter. The Geological Survey initially said the quake had a depth of 142 miles (230km), but it later revised its estimate to say the quake was 6 miles (10 km) deep, putting it fairly close to the surface. An aftershock hit about half an hour later, with a preliminary magnitude of 4.8 and a depth of 6 miles, the USGS said. 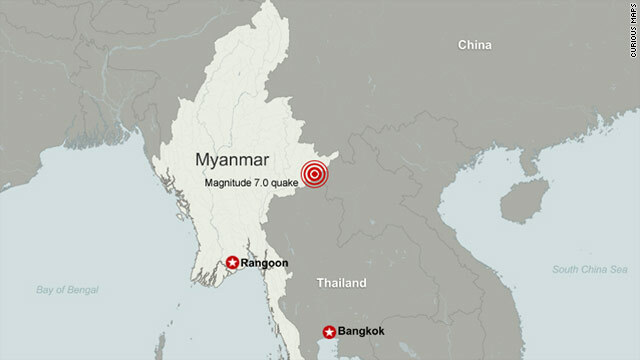 The center of the quake was 365 miles (589 km) northeast of Rangoon, the former capital of Myanmar. It was 104 miles (168 km) south-southwest of Yunjinghong, Yunnan, China. A destructive tsunami is not expected, the Pacific Tsunami Warning Center said. Myanmar, which is also known as Burma, has been badly hit by natural disasters in the past few years. A powerful cyclone in 2008 left an estimated 100,000 people dead, and another one two years later left 70,000 people homeless, the United Nations estimates. The quake was significantly less powerful than the one that hit Japan two weeks ago, causing a tsunami, leaving thousands dead or missing, and prompting fears of a nuclear meltdown. It was roughly comparable in magnitude and depth to last year's Haiti earthquake, which measured 7.0. More than 200,000 people died in the Haiti earthquake, and millions were affected. That quake's center was only nine miles below the surface and near congested population centers. Scientists said if the quake had been centered deeper down, the damage would not have been as severe. CNN's Moni Basu and Josh Levs contributed to this report.